The Electrohome Wellington Record Player is one of the most recognizable brands when it comes to listening to your collection of vinyl that has collected dust over the years. Designed for professional DJs and for home entertainment it provides you with a vintage look, and loaded with some of the latest technology features with a traditional look and the best for a good reason. The only concern with this record player is that it is very heavy and not a traveling companion when in need of moving the party to another’s home. With the Electrohome Wellington Record Player, standing in your family entertainment room one cannot miss it. It has a great vintage look with fine handwork details. It provides all with a breathing nostalgia with great sound quality. 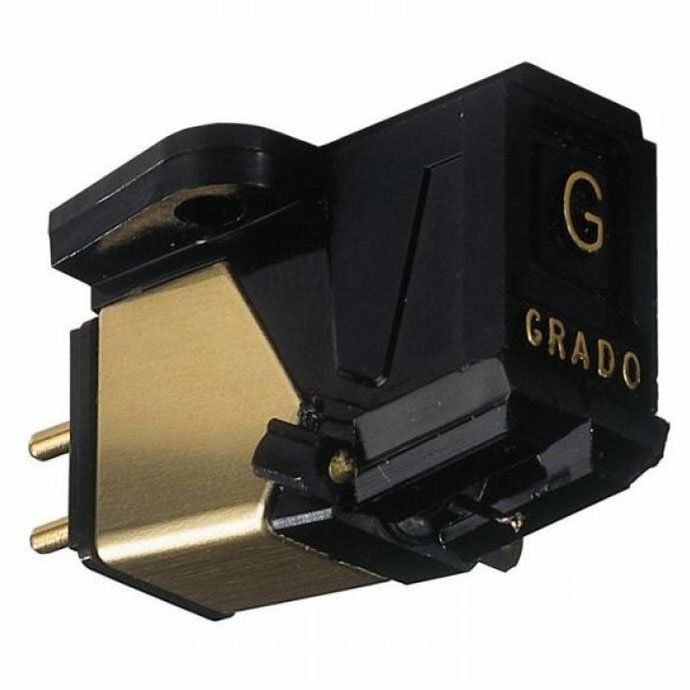 However, do not let this instrument misleads you as it is packed with both vintage and modern functionality making it one of the best vintage turntable. 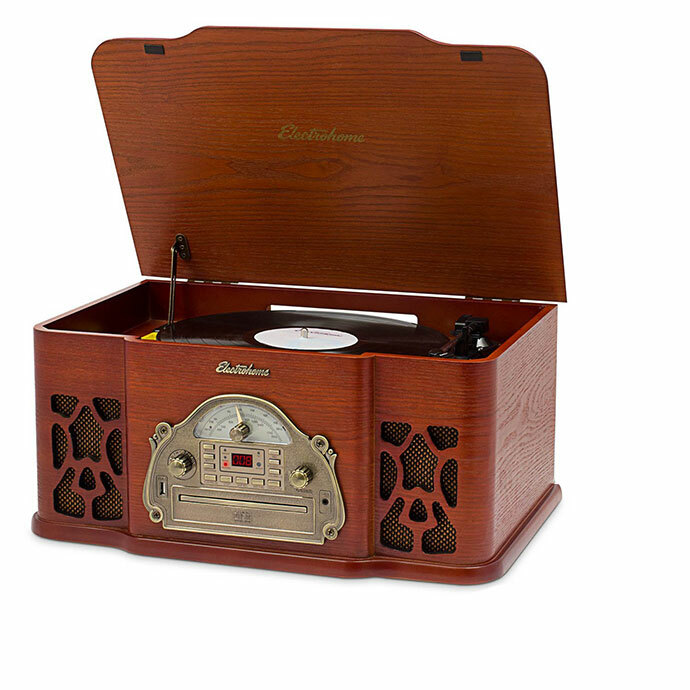 The Wellington record player is perfect for music lovers with a big collection of vinyl records. Whether you have 7-inch, 10-inch, or 12-inch, you can enjoy your vinyl on this vintage device. It looks great no matter where you place it in your home, pub, or restaurant, providing it with the vintage look it deserves. Made with mahogany, it enhances the sound quality with the built-in dual range speakers and if you want to listen to your vinyl, wherever you go transfer the music to USB. 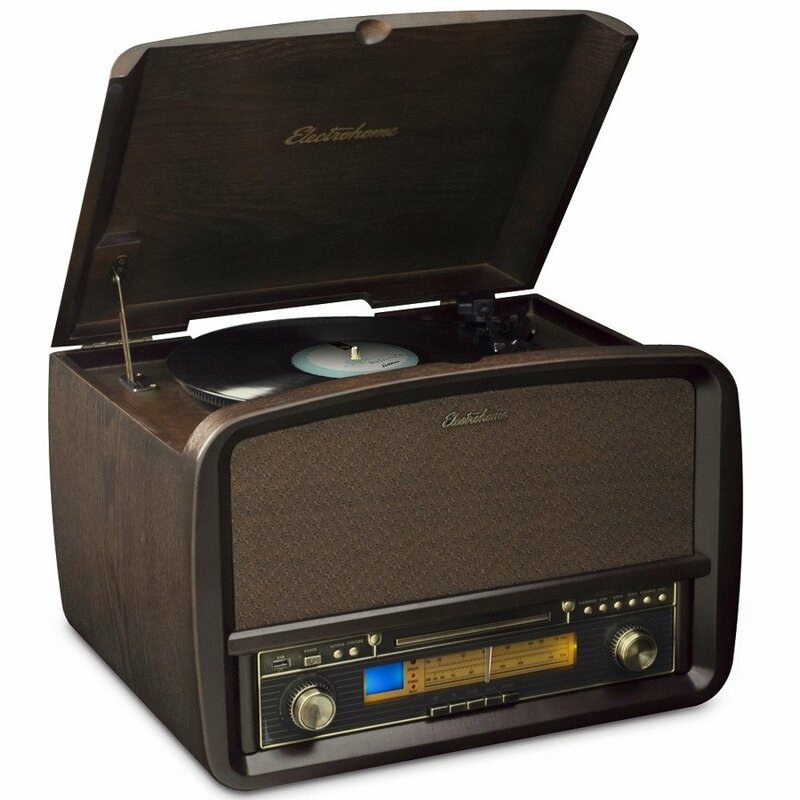 Play your vinyl, enjoy the AM/FM radio, CD, and handles all types of music carriers from your tablet to a Smartphone. The speakers provide you with above average sound without disturbance even when increasing the volume or listening to music with loads of bass. Converting your records is easy as it is equipped with USB for transferring music to a PC while storing your old tunes to enjoy. 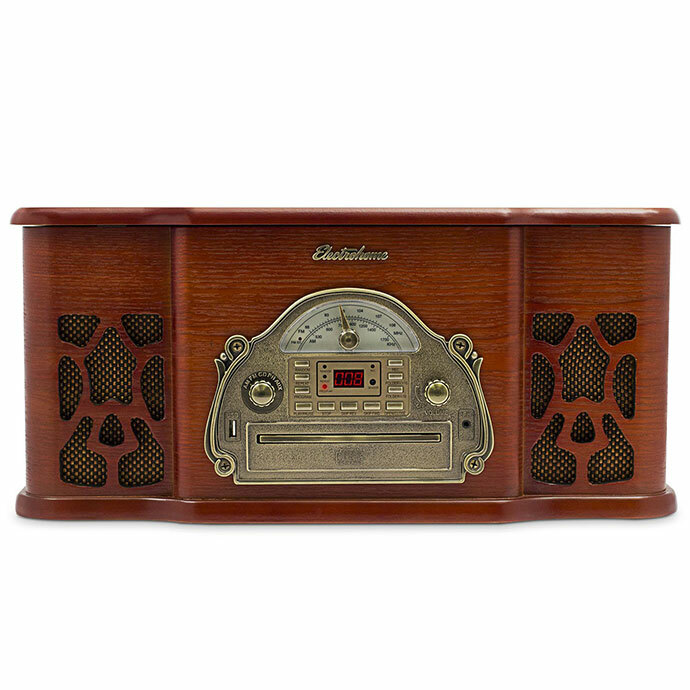 The retro system makes for great home entertainment with fine details with amber lighting found on the analog tuning dial and rotary control knob with an antiqued patina faceplate to complement and décor found in your home. The Electrohome Wellington Record Player sound features and looks impressive and will leave you with an electrified experience. A vintage look that meets modern technology and worth the money spent on it. It is a durable electronic turntable to listen to your collection of vinyl records and versatile to enjoy any type of music device. Order your record player now! 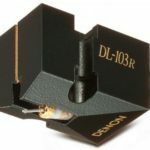 In a case you don’t like Electrohome Wellington Record Player, which is one of the best vintage turntable on a market today, you can always read something about some others vintage record players: Pyle PTCDCS32BT Retro Vintage Turntable Review or maybe Electrohome Signature Vinyl Record Player.